Coat the bottom and side of a 10-inch springform pan with nonstick cooking spray. For the crust: In a large mixing bowl, beat 1/4 cup of the butter and 1/4 cup of the granulated sugar with an electric mixer on medium speed about 30 seconds or until creamy. Add flour, baking powder and salt, beating on low speed until combined and crumbly. Press mixture onto the bottom of the prepared pan. Bake in a 350 degree F oven for 10 to 12 minutes or until set and light golden brown. Meanwhile, in a large mixing bowl, beat cream cheese, brown sugar and the remaining 3/4 cup butter on medium speed about 2 minutes or until creamy. Beat in corn syrup, 1 teaspoon of the pumpkin pie spice and vanilla. Beat in pumpkin, eggs and egg yolks until combined. 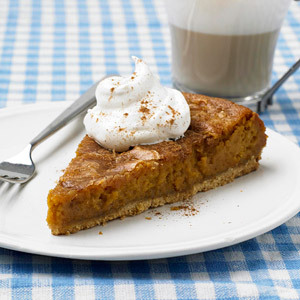 Pour pumpkin mixture over partially baked crust. In a small bowl, combine remaining 1/4 cup granulated sugar and 1 teaspoon pumpkin pie spice; sprinkle over filling. Bake for 45 to 50 minutes or until top is set and golden brown and cake pulls away from side of pan. Cool in pan on wire rack 1 hour. Loosen side of pan and remove. Cool cake completely. If you like, serve with whipped cream and sprinkle with additional pumpkin pie spice. Makes 10 servings.